Just a few weeks ago, I set out early one morning with my husband and oldest son to hike 13 miles from Interlaken to Murren in Switzerland. Now 13 miles might not seem like a lot in one day, but we climbed from an elevation of 1800 to 5500 feet. Amazing hiking! Steep in places, narrow flat ledges in others, and even some flat land. But the views . . . oh my gosh . . . the views! To my delight, most of the hike was very secluded seeing no one else at all between little villages. The views at about 3000 feet. Then we happened upon the scene below. Like many of the farms in the Alps, there are no roads to this farmhouse. You hike up the side of a heavily wooded cliff for several hours to get here. There is a village – also without cars – not terribly far away. But do you notice anything odd about this house? 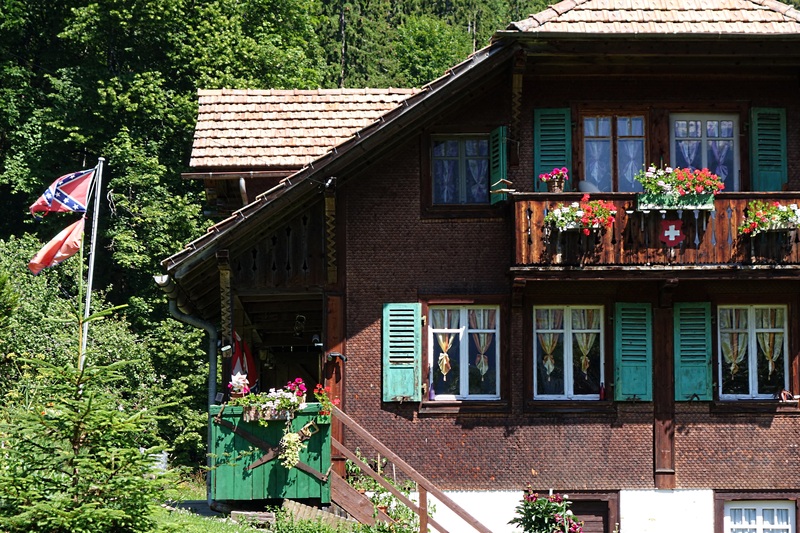 A house in the Alps – in the middle of nowhere – with a confederate flag flying! There was a confederate flag on a pole beside the house and one hanging on the wall of the side porch. What the heck? Were these people from the American south? Were they flying it because they were proud of their heritage? Did they know of the controversy it was presently causing in America? Weren’t the Swiss supposed to be peacemakers? We were baffled. We stood on the path, stared at the house, and considered knocking on the door and asking. But despite the flower filled window boxes, it just felt so creepy. Quickly, together we decided that it wasn’t a good idea. So we started our own little investigation. We could actually see the house and the flag from an aerial view of the Jungfrau region taken several years ago. The confederate flag was flying at this house even then. So it was a good bet that they weren’t making a statement aligning themselves with those clinging to it during the present controversy. But maybe they were still from the American south? But then we discovered something truly horrible! In 1947, the Germans and Swiss outlawed the Nazi flag. No surprise there. It represented the torture and massacre of thousands of Jews – who would want to fly it anyway? However, those still sympathetic to the Nazi mentality — the idea that the Aryan race was superior to all others — looked for a new symbol to display. They wanted another flag to fly that would identify them as “haters” of everyone but the superior white race. They looked around and saw the Confederate Flag. They saw the hatred of African-Americans represented by it. After all, it represented thousands of African-Americans kidnapped and enslaved for the purposes of the White race. So the Nazis adopted it as their new symbol! This little alpine farmhouse is owned by a modern day Nazi and here they were flying their symbol of hate. Glad we didn’t stop to talk. “All who hate a brother or sister are murderers” (1Jo 3:15). 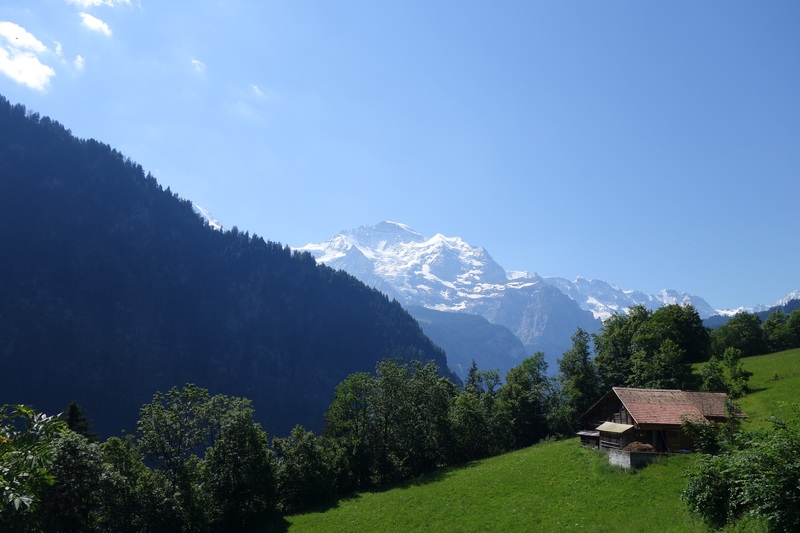 Hike from Interlaken to Murren – Steve and Brent are on the left side. Click to enlarge.